> Every furikake bottle will have a hole on the lid so furikake will come out easily by shaking the bottle. Turn the lid left or right to open and close. > To fill furikake into the bottle, first open the lid. > Then use a small spoon or funnel (might come with the furikake bottle or not) to put the furikake inside the bottle. Don't worry if the furikake bottle doesn't come with funnel because almost every bottle come with a large neck so it's easy to fill. Hehee...looks like a toy shop. Everything is so pretty and cute. 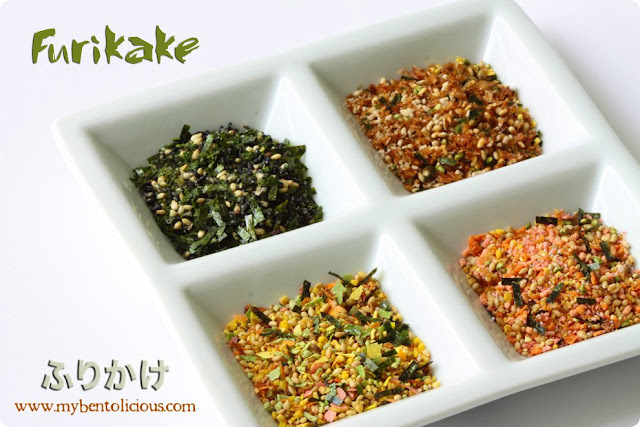 I love furikake, I used to sprinkle it on my rice. Oh Lia, I just need to come on vacation to your town so I can buy all these super cute bento supplies you show us! @noobcook : Some of them I got it from Daiso. My friend said she saw the Hello Kitty and Pooh one in one of the stationery store at Chinatown, Singapore. Forgot the store name. Thanks Wiffy! I've got pink (probably salmon then), light green (green tea? ), dark green (horseradish? ), mustard colour (erm.. mustard seeds?) and orange. That last one has a vague picture that could be meat or fish... Here's a picture, if you care to look. Have you ever tried the black sesame and salt variety? I think that's my favorite kind. I don't have any furikake bottles. I must now get some as you've presented them to be absolutely darling. Lia, anyone scanning this post will think these are toys, hehe! That Mickey one is sooo cute - never seen it before! Your furikake collection is impressive too, wow! I also have that display dish, I think it's perfct for this purpose. Can't decide if Ilike your bento or your tips posts better; they are all so lovely!! @Jenn : Chocolate sprinkles maybe? Hope you can get some to add to your bento stuffs collection ;) Thanks a lot Jenn! As my friend says, awesome-sauce! I like the hello kitty one container, and recently I've been eating lots of noritamago furikake~but I should switch it up! thanks Lia! @megan : I didn't mean to make you jealous Megan hehehe ... *peace* I decided to make some post about bento related items, and me myself amazed how much bento related items we can get ;) Thanks a lot Megan! I think my boy will scream if he sees the Thomas one! I just ordered my first furikake yesterday! After seeing this post I couldn't help myself. 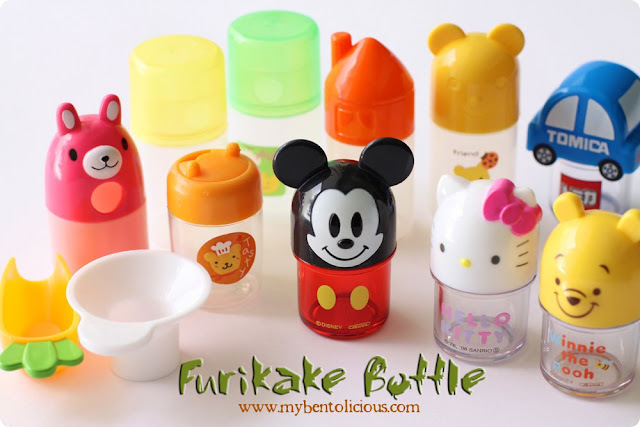 Love all of your cute bottles, You have a impressive collection of bento goodies! @Angeleyes : I've got the fancy one from iSetan, Singapore and some are sent by my friend from Japan. In Jakarta, we just have the big pack not the small pack with cute characters ;) Thanks for your comment! aww they are so cute! Would love to make a bento one day!